Picasa Web's homepage has been redesigned to emphasize the photos recently uploaded by the people you're following. The homepage no longer displays all your albums, so you'll only be able to see the most recent 8 albums. "This new design centers around photos that are interesting to you. We wanted to give you faster access to the newest photos from your family and friends along with some great photos from the talented Picasa community. 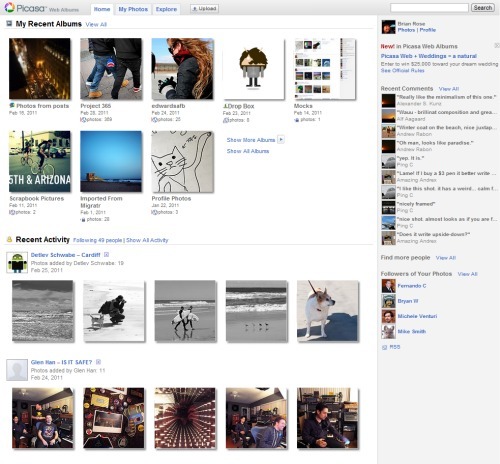 When you log in to Picasa Web Albums, you will not only see your own albums, but albums that have been shared with you, the latest public albums from people you follow, and featured photos from the Picasa community right on your home page," explains Google's Ping Chen. While "recent activity" has always been a section on the homepage, now you can no ignore it. YouTube's homepage has recently switched to a feed view, a stream of activities popularized by Facebook. If you don't like the new homepage, bookmark this URL: https://picasaweb.google.com/lh/myphotos or click "My Photos" when visiting the homepage. Yeah yeah yeah... BUT when will Google Me come ?! When all the pieces have been placed on the board. The last piece will more likely be a completely redesign profile page. We need Sort by:NAME we cant even sort the abbums alphabetically. This is so sad, they fixed this before they added something as simple as ordering the ablums by name. When will this come????? David Knowles : @Google I/O ? Given the current pace of launches of components that would be my guest. But remember none of Google products or components or at least parts that I think are essential for Google me have had any public announcements or marketing behind them as of yet, an most are US only. I suspect Google may actually avoid a big launch event, an just evolve there services into Google me without any announcements at all. They are appearing so far to be taking evolutionary steps rather than revolutionary step. An we have yet to see the glue that will stick all this together. This is more of start up type tactic rather than a established player would use, low key launch. Nice... Google is always finding ways to improve their service to the users. Ok... Now could they put the geolocation map back to Terrain view? It looked so much nicer. Is there any news why almost all the small thumbnails in our blogrolls went missing last week? Amnd why are some still showing?? How about a share to facebook. I want to share my videos that I can now upload to Picasa Web on facebook. Why can't I??! It has nice features like script writing... HOWEVER, it is not compatible with all Windows older version and some of Mac. Since not everybody upgrade to newer version, Google should fix all compatibility issue before publishing it. How do you figure that it centers around the photos most interesting to me? Picasa has become "GOOGLE" centered and doesn't help the Picasa user any more!!!!! It used to be a great program tp use but has turned away from this and isn't a good program to use now!!!!! I can't even reach someone that can help me with a problem. Picasaweb is appalling. It requires me to open an account first and download all their software. NO way, Jose. A friend of mine would like me to see his Peru photographs and now that is impossible.